LinenSpa, renowned brand in mattresses and bedding segment has a wide range of product portfolio – mattresses, toppers, pillows, linens, mattress protectors and all bedding accessories. The company has also earned overwhelming reviews and 5 star ratings like no other brand in the market. Following stats speak for themselves. Hybrid mattresses are a big hit with people who love to 1. experience the luxury of sleeping on memory foam and also 2. who need the support of innerspring coils. And LinenSpa has employed a combination of both memory foam and innerspring coils in this 12 inch hybrid mattress construction. It has also secured highest rating and equally impressive number of reviews for this 12 inch hybrid mattress, unmatched in the industry. LinenSpa has employed a 4 layer construction in this 12 inch hybrid mattress. In most gel mattresses, cooling gel infused memory foam is placed as topmost layer followed by comfort foam. However, LinenSpa has placed a 1 inch memory foam on top which is quilted and also acts as a cover. The second layer is also memory foam but this one is infused with cooling gel. On the whole, the mattress has 3 inches of memory foam and offers utmost comfort to sleepers. The gel infusion helps maintain the sleeping surface cool all the while. The experience of sleeping on a cool surface is class apart. 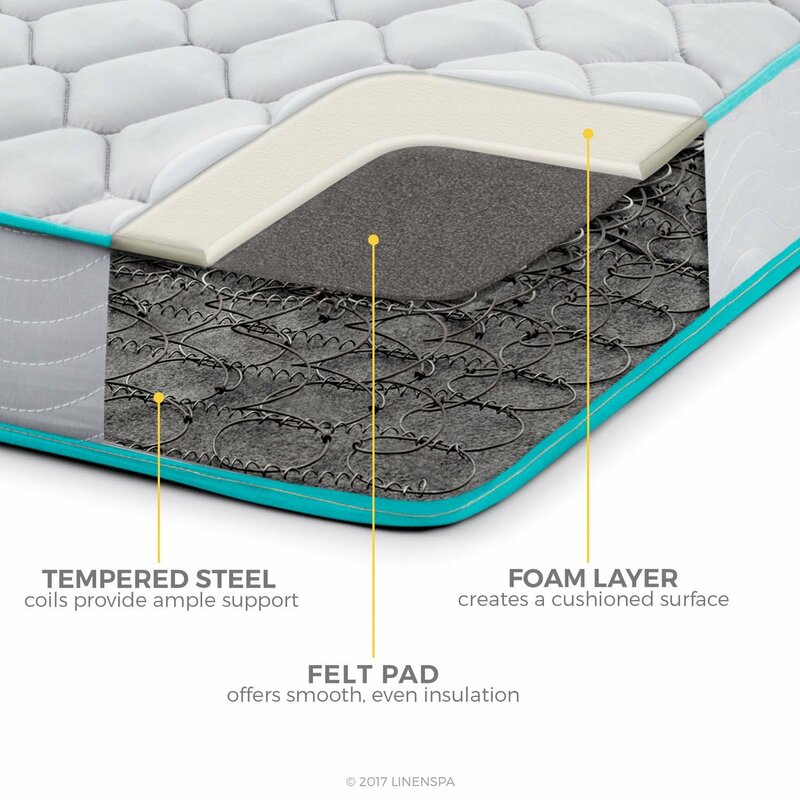 The transition layer which is 1 inch thick and acts as a felt pad protects the top memory foam layers from directly coming in contact with innerspring coils. In regular memory foam mattresses, this layer is typically made from high density foam. But in hybrid mattresses, the high density foam is replaced with innerspring coils. These are more effective in holding body weight and in this 12 inch hybrid mattress from LinenSpa, there are 8 inch steel tempered coils. And each of these coils are again individually encased and also foam padded. This encasement protect the coils even when liquids happen to spill on the mattress and the foam pad around each coil is soft and avoid scratching the top transition layer. On a scale of 1 to 10, the overall firmness of this 12 inch mattress stands at 6, which is again widely accepted firmness level by most consumers. 8 inch steel coils are in fact extra large by industry standards and they perfectly sustain your body weight and not allow you to sink deep into the mattress. The only layers that sink with weight are the top two memory foam layers that are combined 3 inches. This means, the maximum sink as well as the radius of impact on applying pressure is no more than 4 inches. And as you move and roll on the mattress while asleep, the motion is not carried to your sleeping partner. LinenSpa offers 10-Year warranty against all manufacturing defects on its 12 inch hybrid mattress. LinenSpa is the highest selling brand in 8 inch mattress category. Thanks to the hybrid construction, it has both memory foam as topmost layer and innerspring coils as the base layer. In regular 8 inch memory foam mattresses the bottom layer is made from high density memory foam that is typically around 5 inches. However, when adults tend to use low height mattresses, there is always this problem of the mattress sinking down to floor completely. LinenSpa has come up with a smart hybrid design to overcome this very issue with low height mattresses. Perhaps, this is the very reason why it sells in huge numbers. The meticulous design of having memory foam as topmost layer while embedding innerspring coils as base layer is purely intended to help you enjoy the luxurious comfort of a memory foam mattress and thus removing the fear of you hitting the floor. The steel coils are very effective in holding your body weight and avoid you from sinking further downwards. In case you are looking for an innerspring mattress but still want the comfort of a memory foam mattress then LinenSpa 8 inch hybrid mattress is what you have been looking for. In all other memory foam mattresses, this layer is typically 1 to 2 inches, sometimes even 3 inches as well, but these are only for mattresses that are on the larger size, around 10 inches, 12 inches and 14 inches. Whereas, in this medium size 8 inch mattress, LinenSpa has carefully embedded a half inch memory foam layer within the top quilt. This layer provides the much needed luxurious plush feel the moment you lie on it. The quilt surface is again very soft in feel and is a well knit fabric cover that perfectly holds the memory foam layer. When you lie on a memory foam mattress, you would surely notice that the top layer aligns with your body curvature. And at critical points like shoulders and lower back, the layers tend to dip while distributing body weight equally. 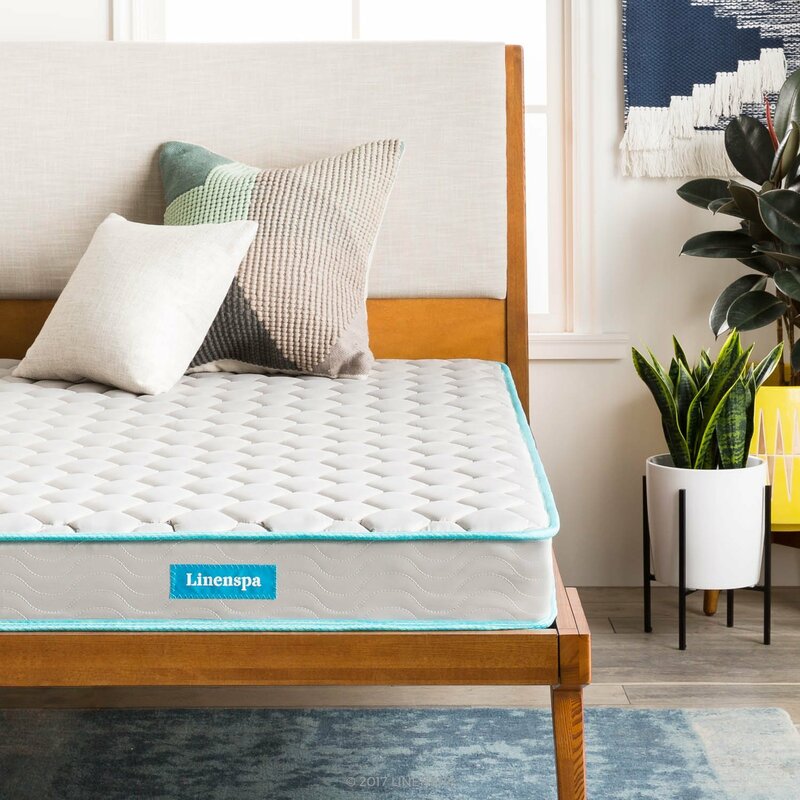 In case of LinenSpa, this 1.5 inch comfort layer along with the 0.5 inch memory foam layer perfectly absorb body weight and distribute it evenly across entire sleeping surface. You would never feel that your body has dipped too deep into the mattress at critical pressure points around neck and shoulders. The layer just aligns around these pressure points thus providing the much needed relief to help you quickly fall asleep. The bottommost layer is made from tempered steel coils standing at a height of 6 inches. If you have tried sleeping on a latex foam mattress you might have noticed the superb yet uneven bouncy feel. Latex foams also tend to dip deep into the surface as they lack the solid base thus resulting in pain around pressure points. Whereas, the problem with high density memory foam layers is that these appear quite solid and give a very firm feel thus depriving you of the comfort that you expect from sleeping on a memory foam mattress. The advantage of having innerspring coils is that they provide both bouncy feel as well as the critical support to absorb your weight and prevent you from sinking too deep into the mattress. There is a very thin layer sandwiched between the comfort layer and bottom spring coils layer. Its main function is to insulate the spring coils from coming in direct contact with the above comfort layer. This way no matter how deep you try to push yourself down, you would never feel the steel coils. Both memory foam layer plus comfort layer absorb your body weight while sinking no more than 1 inch. To test any mattress you have to test it at the key pressure points i.e. around shoulders and lower back. User feedback suggests that upon applying greater pressure at these points, the mattress would sink by around 1 to 1.5 inches without touching the bottom spring coils. And the moment you remove your hand, both the layers bounce back to normalcy well within two seconds. This is relatively pretty quick. As per a user who feared he would sink too dip into the mattress was in fact very happy as the mattress successfully sustained his above average weight. Perhaps, this is why LinenSpa has highest number of 5 star ratings. 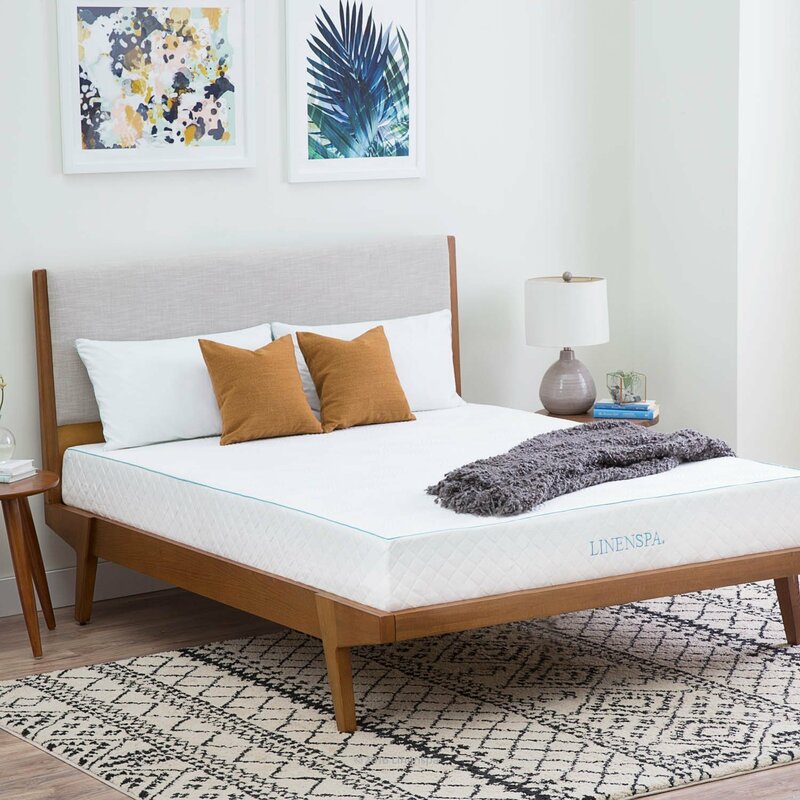 Unlike traditional spring mattresses that are primarily designed to offer just back support, LinenSpa with an additional layer of memory foam on top of innerspring coils offers added comfort of a memory foam mattress as well. It offers both the firmness of a spring mattress as well as the comfort of a memory foam mattress in equal proportions. 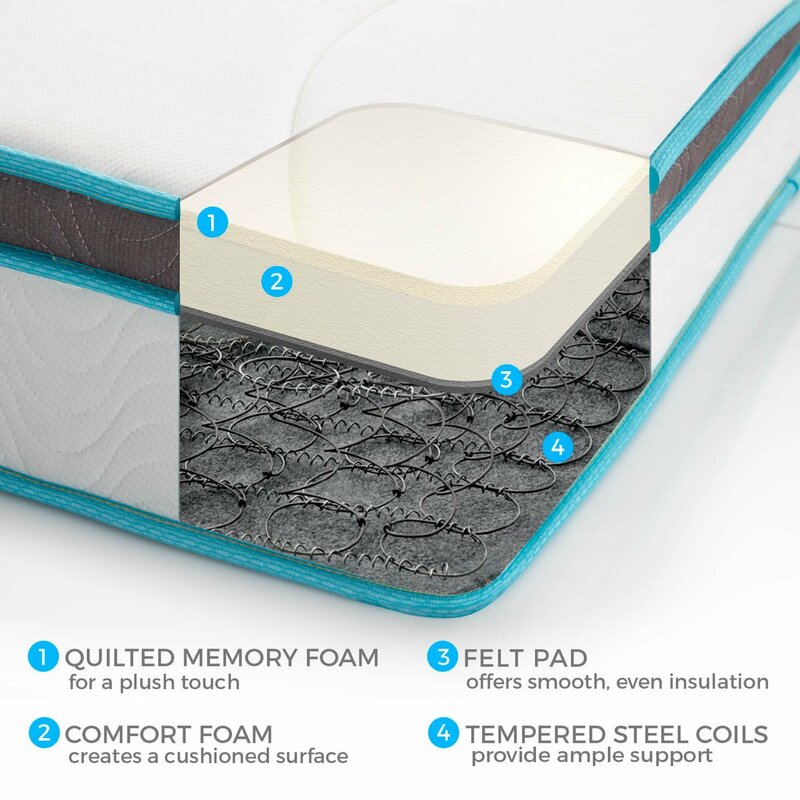 Just like in 8 inch mattress, a half inch memory foam layer has been carefully knitted into the smooth quilted cover. The moment you lie on the mattress, you can experience both the soft surface of the cover plus the plush feel of the memory foam. Bouncy on one side, innerspring mattresses are mainly preferred for the firmness they offer. Traditional spring mattresses offer the much needed firmness for those who have issues with back pain. What’s the added advantage with LinenSpa’s hybrid design? Plush surface of memory foam on top of bouncy spring coils is just like icing on the cake. Perhaps, this hybrid design has surely met the expectations of several thousands of users as we get to see thousands of verified purchases and positive reviews on online retail portals. This insulation is intended to ensure that you do not directly feel the spring coils when you lie of the mattress. The felt pad serves as intermediary layer between the soft memory foam and the solid spring coils and it evenly distributes the body weight as well avoiding your body from directly coming in contact with coils. 6 inch mattress is a perfect fit for bunk beds and for kids especially. If adults wish you use it as well, then I would personally suggest you to place another 2 inch memory foam topper on the mattress surface. The mattress on the whole offers medium firmness. The plush memory foam adds the comfort level that you might want to enjoy while the innersprings offer the right level of firmness required to support your overall bodyweight. The mattress sinks by 1 inch to 1.5 inch when you apply pressure but upon release, it quickly responds and gets back to normalcy within couple of seconds. Durability of an innerspring mattress is directly proportional to the quality of the steel coils. In this 6 inch mattress, LinenSpa has employed high gauge tempered steel coils that offer excellent support as well. 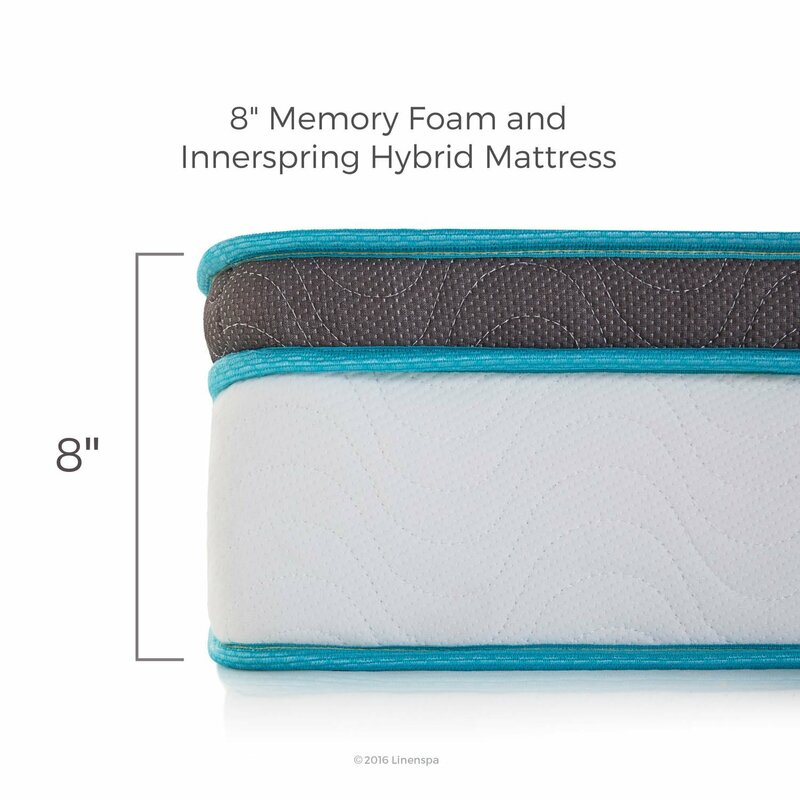 Innerspring mattresses are known to last longer than memory foam mattresses in general. While memory foam mattresses are too fragile to handle and need mattress protectors to avoid liquid spill from damaging different foams across multiple layers. Whereas, innerspring mattresses are easy to clean, support deep cleansing as well without worrying about damage to coils. 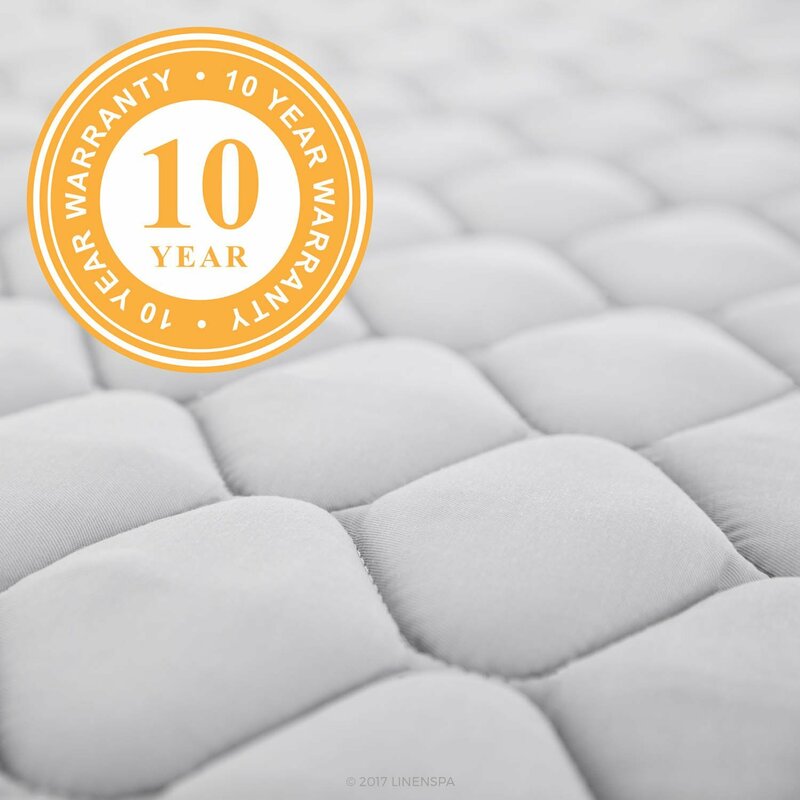 LinenSpa mattresses come with a 10 year warranty. 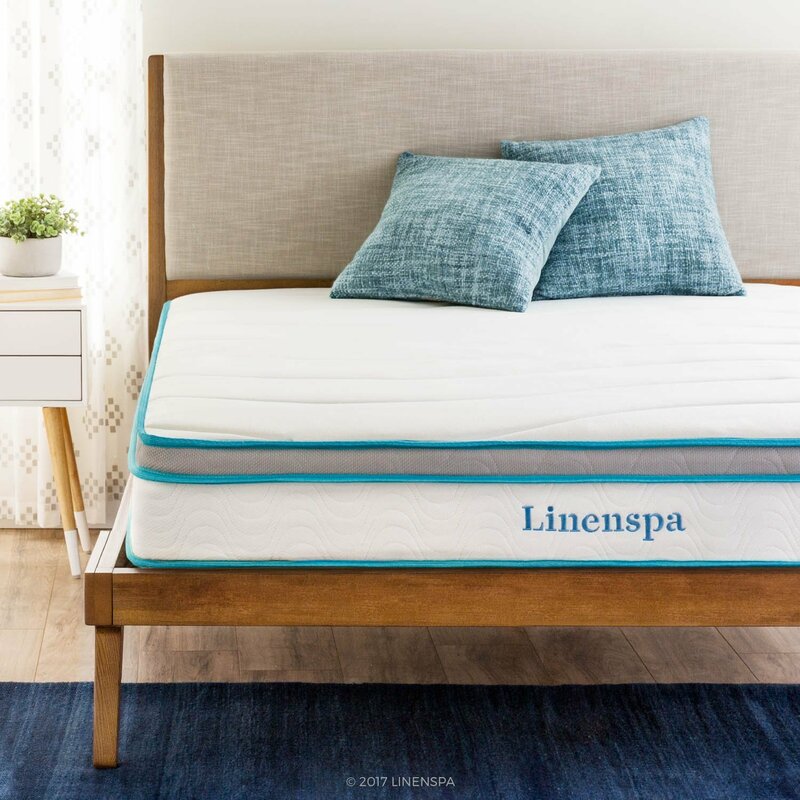 The customer support is exceptional and LinenSpa, in fact is known for providing one of the best rated customer satisfaction in the entire mattress industry. 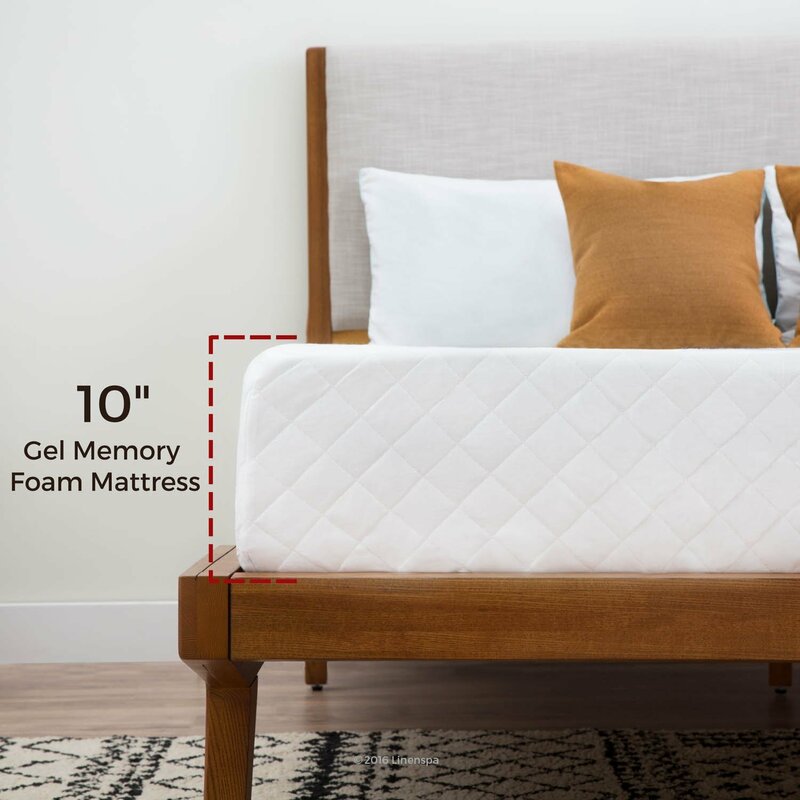 Unlike other gel memory foam mattresses, LinenSpa has employed one of the simplest of designs in its 10 inch memory foam mattress. It has dual-layer construction with 3.5 inch gel memory foam as top layer and 6.5 inch high density foam as base layer. In a gist, LinenSpa 10 inch mattress offers simple dual layered design with top quality material, 25 Year warranty, CertiPUR-US certified and a reasonable price tag. Placing a 3.5 inch gel memory foam as topmost layer is mostly unseen in other mattress. Gel memory foam is pricey and very plush in feel. Other mattresses brands place either 1 or 1.5 inch gel layer and follow it up with another 1.5 or 2 inch comfort memory layer. However, LinenSpa offering a 3.5 inch gel layer in a 10 inch mattress is surely a takeaway. With 3.5 inch layer’s sprinkled gel beads offer THE BEST cooling effect one might expect from a 10 inch mattress. In this mattress, 3.5 inch thick gel layer with open cell structure offers exceptional breathability. When gel beads or liquid gel is infused in a memory foam layer, the cell structure opens up and offers enhanced airflow and dissipates heat away from our body. As the gel layer sinks to a maximum of 1 to 2 inches upon applying pressure. It perfectly aligns with body curvature around neck, shoulders and hips. Memory foam mattresses have high density foam as base layer. In this mattress from LinenSpa, the base layer is made from 6.5 inch HD layer with a closed cell structure. Thanks to the quality of high density foam chosen by LinenSpa, no matter how hard you try, the mattress would never bottom-out unless you intentionally jump on it from the rooftop. As the top gel layer measures 3.5 inch thick and is somehow on the higher side, but owing to the open cell structure the layer bounces back to normalcy within a span of one second. It is very responsive in nature. Whereas, if you compress the base layer as well by applying immense pressure, the mattress will take around 2 seconds to return to flatness. As the bottom base layer is made from high density material, the foam takes couple more seconds to get back to normalcy owing to the compact cell structure of high density foams. No matter whether you are back sleeper or side sleeper, this 10 inch mattress from LinenSpa offers best back pain relief owing to its layer structure. The mattress on the whole offers medium level of firmness wherein the 3.5 inch gel layer perfectly aligns around pressure points like shoulders and lower back/hips. In case you are on the above average side, the gel layer might sink by around 2 to 2.5 inches but still you will not touch the bottom base layer. The base layer is enough sturdy and avoids the mattress from bottoming out. LinenSpa offers a 25-year warranty on the mattress as well as the bamboo cover against all manufacturer defects. The customer service offered by the company, as discussed earlier, is top-notch and a benchmark for other players in the industry.